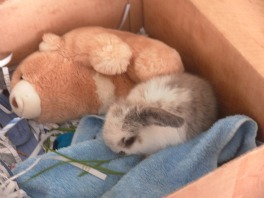 Vanilla is my 6wk old mini lop dwarf baby bunny. I bought her yesterday at a pet shop. She loves to explore and look around but is still a little bit scared as it is her new home and she is away from her sister. She had to spend last night in her box in my room as it is winter and way to cold for her to out in the hutch. One really pretty thing about Vanilla is that she has two blue eyes. One funny thing about vanilla is that she has one floppy ear. Vanilla is a gorgeous addition to the family.